A diamond station necklace is a classic piece of jewelry that your bridal party will be able to enjoy for many years to come. Your bridal party is your biggest support system during your wedding planning. Saying thank you for all of the countless hours and of hard work and preparation is an important part not to overlook during this process. The best gifts are those that you would also want to receive– something that can be enjoyed for many years after your wedding is over. A piece of jewelry, such as a bezel station necklace is a perfect choice. 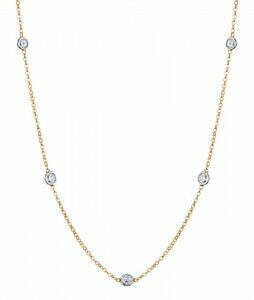 A diamond station necklace is a universal piece of jewelry that can either be dressed up or dressed down. It can be worn by your bridesmaids on your wedding day as part of their wedding jewelry, or it can be one of their gifts presented to them after the wedding. A diamond necklace can be customized with different total carat weights, metal types, and even number of diamonds. For a pop of color, your bridesmaids will also love our gemstone bezel necklaces. What other ways are thoughtful ideas to thank your bridal party of a job well done? Let us know in the comments section so that all of our readers can enjoy your tips as well.